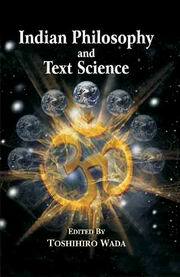 The present book aims at clarifying various aspects of Indian philosophy by applying concepts used in text science towards their analysis. Text science attempts to establish universal rules which apply to all forms of human expression. If we regard all human expression, "including behavior', as communication, it contains a meaning-system whether it has the form of language or not. Human expression may be classified as language, figure, body action, and so forth; we consider all these forms of expression to be texts, for which there must apply universal rules. The aim of text science is to explain how these rules function throughout various types of texts and thus provide a better understanding of human behavior. Here the direction of analysis is from context to text it is also possible to move from text to context. We can arrive at a new context from texts such as commentaries, which context cannot be discovered through reading only one of those texts such a context will certainly help us coherently interpret other texts related to the texts. The concept of context and these two directions of analysis may not be necessarily new tools to scholars of Indian studies, who often adopt this method unconsciously. However, we aim to use this method consciously here. It is an underlying principle of this book that in order to understand texts written in Sanskrit or other languages, we need to turn our attention towards factors outside of them, such as information provided by other areas of study, which factors we call context. All the contributors of this book have made particular use of this concept in their analysis nine papers have been organized into four parts: (I) General, (II) Buddhism, (III) Vedanta, Mimamsa and Vyakarana and (IV) Nyaya and Vaisesika. Dr. Toshihiro Wada is Professor of Indian studies, at Nagoya University, Japan. He obtained a Ph.D. degree from the University of Poona in 1998 and D.Litt from Nagoya University, Japan in 2002. He mainly works on logic and philosophy of language in Navya-nyaya and published two books: Invariable Concomitance in Navya-nyaya in 1990 and The Analytical method of Navya-nyaya in 2007. His papers appear in Journal of Indian philosophy, Asiatische studien, acts Asiatica, and Nagoya studies in Indian culture and Buddhism: Sambhasa, and so forth.